There are approximately 45,000 home electrical fires each year. 3 in 5 home electrical fires involve lighting equipment or home electrical wiring. Peak months for electrical fire deaths are November through March. Home electrical fire deaths peak between midnight and 8 a.m.
Move over for emergency responders! When you see emergency lights, slow down and move over to keep working responders safe. 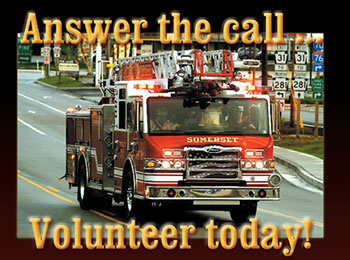 The Somerset Fire Department is currently seeking new members to help serve our community. Responding to almost 400 calls for service per year is a demanding job and WE NEED YOUR HELP! To learn how you can serve your community call 445.4343 for more information.